Built between 1810 and 1830, the fine three-storey building, that housed this and many other businesses over the years, is one of the oldest on the Main Street. From at least 1824, Jonathon Hill was a grocer and haberdasher here. He died in May 1849 and was succeeded by - his wife? daughter? - Frances. The property was leased from Mrs Sophia J. Stoker - also the immediate lessor of the previous building - who, as already mentioned in the entry for Nos. 29 & 30 Main Street, may or may not have been related to Bram Stoker, creator of Dracula. In the 1860's, the property belonged to grocer and spirit dealer, John Boland and his wife Catherine. In 1876, the license was transferred to a William Fitzpatrick and, from at least 1879 - in what seems a strange development – Catherine Boland ran a Temperance Hotel1 here. On January 6, 1891, the following advertisement appeared in The Freeman's Journal: Hotel Boots. Wanted, a boy about 16 years old, steady and industrious, with a knowledge of the hotel business. Apply Boland's, Maryborough. On Census Night a decade later, the widowed Mrs Catherine Boland was on the premises, as were an assistant housekeeper Mary O'Connor; Cook and Attendant Mary Ann McCormack; and Martin Ferrin (? the census form is unclear), a sixteen-year-old boots and messenger. Later that year, what the Leinster Express described as 'that old resting place known as Boland's Hotel' closed for good. The premises lay vacant for some time before becoming a butcher's shop owned by my great-granduncle, Joseph Dunne, originally from Derrygarron, and later 11, Coote Street (where I grew up). The 1911 Census lists Joseph, his wife Mary and ten children, three of whom - Michael, John and Elizabeth - would eventually become synonymous with the shop here. [The family also had a similar business in Tullamore]. Well into living memory, Mick, Jack and Lil were collectively known as 'Dunnes the Butchers' (One Quality. The Best). The shop was noted for its cleanliness - one of my interviewees remarked that "You could eat your dinner off the floor" - and its sausages and puddings (the recipes for which, another old man told me, "Jack Dunne took with him to the grave"). In April 1973, Pat Miller opened Portlaoise Hardware here (Prices are Coming Down!). He later moved to Bull Lane (on the site of the old Kelly-Bergin bottling plant) and, in 2006, opened a new, much larger shop in what was the yard of the old one. There was much surprise in August 2017 when Pat announced that, after fifty years in business, his shop was closing down. He cited the difficulties met by smaller independent businesess and the lack of traffic management in the town as reasons for his decision. Over the last three decades, 64 Main Street has seen the arrival and departure of many different shops. 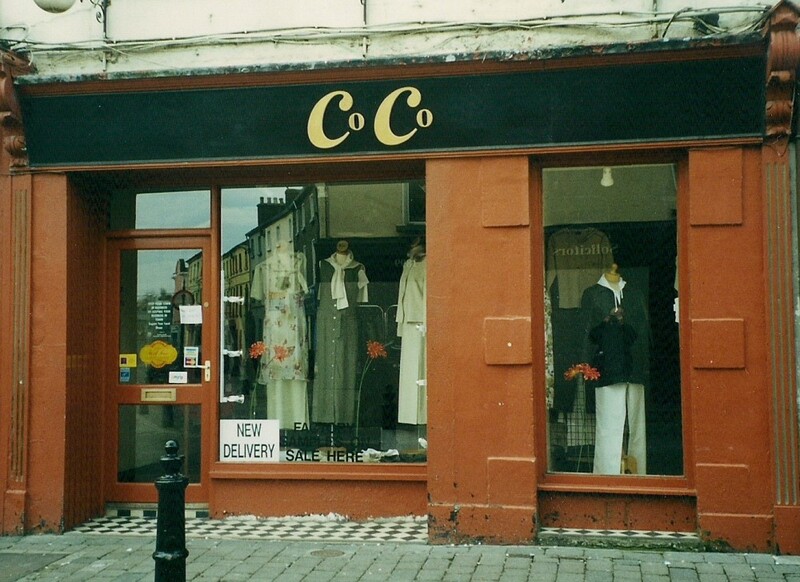 In chronological order: Casards Hair Stylists (Put your head in our expert hands), Helen's Beauty Salon (above Casards), Laois Education Supplies, 'Aisle of White' bridal shop (Pure silk Nighties and Negligees specially designed for the lady in your life), Co Co, Occasions Couture, Herb House (Herbs, Massage, Acupuncture), Modern Trend (Ladies Fahion), and currently (May 2014) Peavoy's (Auctioneers, Valuers and Estate Agents) which was previously located at No. 60. 1 Temperance Hotels - and the spread of tea houses and coffee houses - were a product of the 19th century Temperance Movement. For more on Father Theobald Mathew and the Temperance Movement see entry for No. 13 Bridge Street.